Getting rid of used tires can be quite a hassle. However, if you love the idea of upcycling used items, there are multiple ways to reuse tires. They can be used as garden decor to hold flower beds, can make unique water features or even can be used in a physical fitness routine. If the tire is being used in a manner in which its appearance is important, many people decide to turn the tire inside out to have a smooth and more attractive exterior. In instances where the tire is used purely for its weight, the outer appearance of the tire is not important. While the idea sounds simple, the execution of turning a tire inside out may end up being more difficult than expected. It doesn't require many tools, but it does take a lot of elbow grease and a sharp, durable knife. It is easier to turn a smaller tire inside out than a larger tire, so for small projects like tire planters or flower beds, it's best to stay on the smaller side. Begin by cutting around the tire along the line where the treads and the inner section of the tire divide. Be very careful because this can prove to be tough. You may want to wear protective gloves to avoid any injuries. Once the cut is complete around the tire, pull up on the treads to flip them inward. This will take a lot of strength and might require more than one set of hands. It is also possible to get creative with the design of the tire. Instead of cutting it straight, it can be sliced in a wave pattern to make a floral effect once the tire has been flipped, giving it a more appealing exterior. When the tires are flipped, they can be painted any color to match the look you are trying to achieve in your garden or yard. Flipping tires takes on a whole new meaning when it comes to exercise. For years, tires have been used as a form of weights in heavy-lifting competitions, and they are now making their way into regular daily workout routines. A common form of using tires in a workout is by simply flipping them end over end to move them from one side of the space to another. 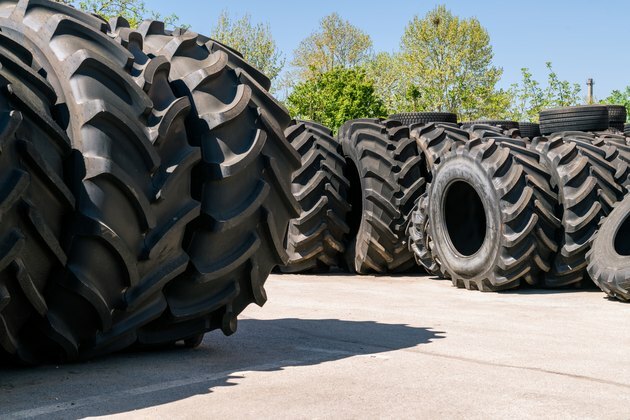 To achieve the best muscle training while using tires, it is best to use large tractor tires that are heavy, creating a challenge for the user. Other methods of using used tractor tires for exercise include standing in the tires and dead-lifting them up and down. They can also be dead-lifted and then transported across the space by walking and carrying the tire. These are great individual workout additions. Tires can also be used in team activities by turning the tire upright and pushing the weight of the tire between two people. If you like more unconventional methods that can also help work out some pent-up aggression, the tire can be hit with a sledgehammer repeatedly for a vigorous training that works lots of different muscle groups. With all these intriguing concepts of how to reuse or repurpose old tires, you may wonder how you can obtain used tires. This can be accomplished through many avenues, such as asking friends and neighbors on social media, locating tires for sale through secondhand sales websites or even locating a waste yard or independent garage and seeing if they have any lingering around. Used tires don't have to be an eyesore in your backyard. With a little bit of imagination, they can be transformed or used for various activities. It simply takes a bit of creativity to come up with alternative uses.